TTL Function Yes, low level (0V): OFF, high level (5V): ON. 1. You can adjust the focal length rotating the laser head, the smallest point size is 3mm. 2. Can be used for laser cutting machine, laser engraving machine, CNC, DIY laser. 3. 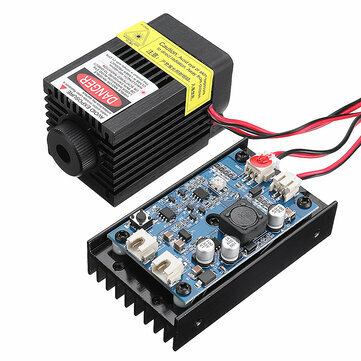 Aircraft aluminum TTL driver board with cooling fan ensure long working time continuously. 4. Suitable for industrial laser engraving machine equipment usage. 1. Please wear laser goggles during usage and avoid touching the laser directly with your eyes and skin! 2. The warranty period of laser module is one month. If you have any quality problem (Except individual situation like using the laser module more than 30 minutes per time and casue the damage), please feel free to ask our customer service for a help. 3. If your laser module has any problem, please DO NOT dismantle it without our permission. It will destroy the laser module. 4. If you have any quality problem about the machine, please feel free to contact us. Many operative problem can be solved according to your video and problem description. Thank you in advance. 5. This laser module is compatible with our EleksMaker machine.